No hint of female legs in Russian orthodox churches. “You may not enter the church dressed like that! Put on this long skirt,” says the old woman pointing at my jeans as I stand on top of the stairs ready to enter the church room in Zapolyarny. “No, no,” father Aleksandr corrects. He points his finger at her. “Just enter, no problem,” he says and turns on the ceiling lights. The priest shows an icon of Anna of Novgorod (1001-1050). In his hands he holds the icon of “Olaf”, Olav the Holy, to show how tight the historical relations between Russia and Norway are. Anna of Novogorod, born Ingegerd Olufsdotter, is wearing a long seemly dress. She was born Princess of Sweden and later become Grand Princess of Kiev. Father Aleksandr uses her as an example to emphasize the church tradition of women needing to cover their body. In the past, it was enough to wear a headskarf hiding the hair of female visitors to Russian Orthodox churches. Recent years ankle-long skirts have made their arrival. Some churches practice it so that visitors can still wear just a scarf when visiting the church for a quiet moment of prayer, but during the services long skirts are obligatory. 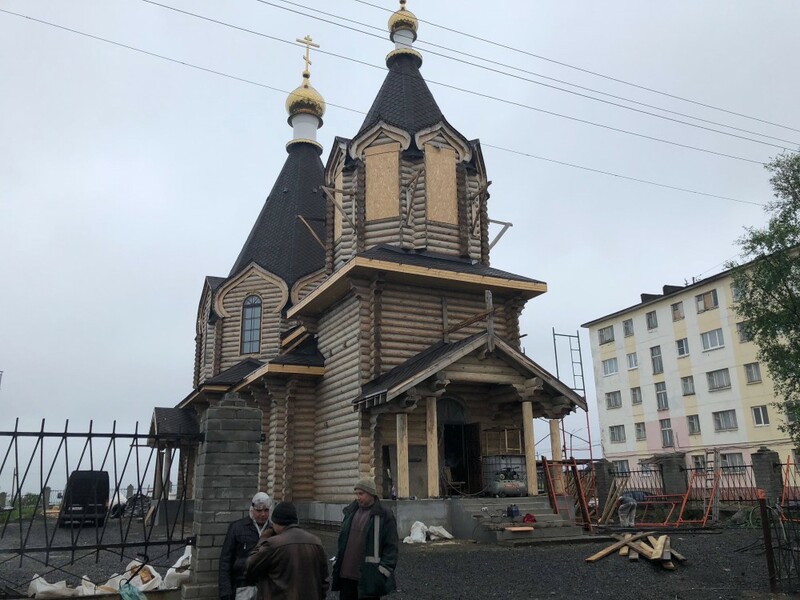 A new church is being built in Zapolyarny. It’s going to be a beautiful compound with gold-plated domes – in stark contrast to the present church located in a former kindergarten. In 1990s Russia a kindergarten could be used to house a night club as well as a church. I just drop into the church without an appointment to try to understand why the long skirts have now become part of the Orthodox church scene, and father Aleksandr willingly welcomes a foreign journalist for a chat. “It’s the old rules of the church, our traditions from earlier times,” says Aleksandr, referring to apostle Paul. Yes. Paul… He also said that a woman should keep silent in assemblies, it´s more an expression of the culture at the time? Isnt`t it? “Yes, well,” the priest answers and continues with another quote saying the woman should not use the man’s clothes and the man does not wear the woman’s clothes. But don’t you really think it´s totally indifferent to God whether a woman has a short or long skirt? “For God is it important that а person has a pure soul. But wearing head cloth and skirt puts you in special state of mind. I do not think this should be an absolute order, because then some people might choose not to go to the church at all. People should understand in their own mind how good it feels to dress according to the old traditions. You feel concentrated and calm. No one looks at you. It´s beautiful and you are brought into your own sphere”. Why has this change taken place the recent time? Does it have anything to do with patriotic flows and the policy being conducted in Russia? “No, it´s just the old tradition of the church. It has nothing to do with politics”, says Alexander and shows a book with photos of people visiting churches around 1900. Aleksandr has interrupted his lunch to have a talk and now invites to share the meal. A tiny and incredibly friendly woman waiters. Soup, cooked salmon and strong, green dill given to the church as gift by a parishioner. The woman puts out confectionary and cookies, there seems to be no end to how well she wants to treat the priest and his guests. I ask him for his view as to the cross border cooperation. A number of the priest’s parishioners knocks on the door during the lunch. Aleksandr points out that they are wearing all kinds of clothes including shorts and t-shirts in the summer heat. But they are also not in the church room for a ceremony, but in his office. 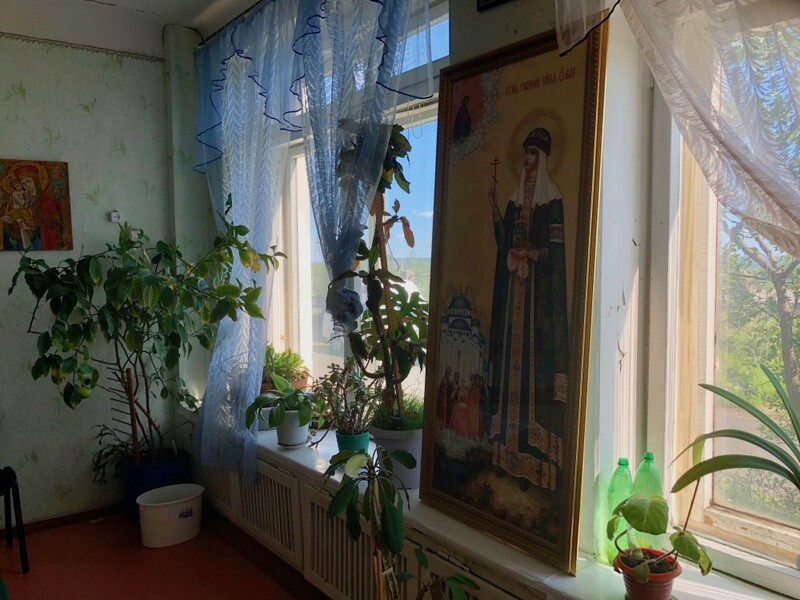 When the lunch is finished the priest wants to show the icon of Anna of Novgorod and when trying to enter the church room the demand of covering up the legs is there, –from the woman assisting in the church. Orthodox women I have talked to repeat what the priest has said. According to bishop emeritus of Hålogoland, Per Oskar Kjølaas, transborder cooperation in the 1990´s was focused on charity work, helping people in physical distress. “Even though there is still a difference in living standards between Norway and Russia there is no need for this now”. Kjølaas says the Church of Norway has comprehensive cooperation with Russia, Sweden and Finland through the Council of Christian Churches in the Barents Region. “We visit each other, especially at higher level, bishops and church leaders from northern Finland, northern Sweden, Hålogaland and Russia”. Kjølaas chaired the council for a period until he retired as a bishop. He describes a significant part of the work is to clear away suspicions and xenophobia, and to discuss collaboration projects. “There have been good friendships across borders. But there can emerge a problem of culture changes following changes of church leaders. This may happen because with a bishop who is more critical to the West”. What meaning do you put into “more critical to the West”? Cooperation takes place on the Tromsø-Murmansk axis, Kjølaas tells. “It´s on smaller scale between Sør-Varanger and Pechenga. 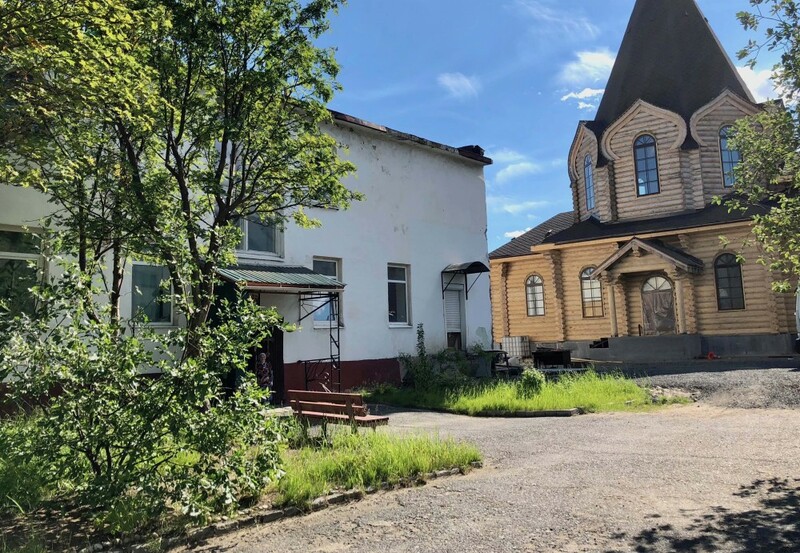 Earlier there was a hope of Boris Gleb serving as a meeting point like it used to be before World War II, and the congregation of Sør-Varanger granted a lot of money as contribution to its restoration. However, it didn’t turn that way. It did not depend on the Orthodox Church, but actually, the area itself is seen to be touchy both in military and political sense”. Kjølaas has observed that the church in Russia is becoming increasingly critical to the West, and points out to the situation in Russia where church and state tend to merge together. What about the long skirts? “It’s the first time I hear about it and I am not quite sure to what degree it is established and guided from the center because there is a lot of local power exercised as well. But it’s a conservative trend and it is done, of course, to avoid sexualization of women, even if it is men who stand for the sexualitation. This is the same way of thinking as in case of burka or nikab. We are not strangers to this in Norway either. For example, women from the Lestadian congregations still cover up to the head as they go to assembly. The skirts obviously are in accord with conservative, patriotic winds. It will be exciting to see how long these winds will blow”. Per Oskar Kjølaas adds that he is far from being content with the Norwegian government policy towards Russia. Later Per Oskar Kjølaas checked the case with his own contacts in Murmansk and the feedback is that the-long-skirt- rule varies from church to church. Put on the long skirt.